Senior forward Abby Redick recorded a triple-double in Drexel’s 89-49 win over The College of William & Mary Jan. 16 in Williamsburg, Va.
Last week had a chance of being perhaps the most disappointing week of the season, but the Drexel women’s basketball team came together late to salvage it. Drexel was blown out at James Madison University Jan. 23 and nearly let one slip away to Northeastern University, but the Dragons hung on late to improve to 9-9 and climb back to .500 on the season. Facing a red-hot squad in Harrisonburg, Va., the Dragons were only able to hang in the game for about ten minutes before getting run over defensively by the Dukes, 74-47. Drexel was a wreck challenging them, allowing five double-digit scorers and 15 offensive rebounds. Head coach Denise Dillon cited poor teamwork as the source of the breakdown. James Madison, on the other hand, was clicking on both sides of the ball. In addition to their distribution of scoring, the Dukes also limited the Dragons to two three-pointers. The leading scorer for the Dragons was Alexis Smith, who scored 13 points off the bench. Drexel had a chance to put the ugly game behind them with a win Jan. 26 against Northeastern at the DAC. Things were not looking good early for the Dragons as the Huskies got out to an 8-0 lead, but the home team crawled back and took a 33-26 lead into halftime. The trend continued in the second half and with a little over five minutes remaining, they held a 51-40 advantage. As the game was winding down, the Huskies began to chip away at the lead quickly. They converted seven straight free throws and got a three-pointer from Tiffany Montagne to cut the 11-point lead down to three. But then Drexel played completely differently down the stretch compared to the JMU game; instead of playing as individuals, they regrouped as a team. “There were moments when you could see them coming together going, ‘Listen, we’ve got this,’ and handle one possession at a time,” Dillon said. Drexel put up a wall defensively, forcing two turnovers in the final two minutes of the game. They also did not allow a field goal from 4:24 remaining until allowing a layup with six seconds remaining to make it 55-52. But by that point, the game was decided and the Dragons, on the strength of their defense and Rachel Pearson’s 23 points, escaped with a 55-52 victory. It was their fourth victory in five Colonial Athletic Association games. After the game, Dillon was impressed with the way her relatively young team responded following the brutal loss just three days earlier. She was particularly thrilled with the way the team stopped the bleeding late and came together as a defensive unit, something she has identified as their strength. The head coach said it was all about stepping back and regrouping as a team, something she doubts they would have been able to do enough to win a game like that earlier this season. “A month and a half ago, we would have lost that game,” Dillon added. “You never want to lose two games in a row, [so] it definitely felt good to get a win after that and hopefully get another one,” Pearson said. Drexel got a chance to create another winning streak when The College of William & Mary visited the Daskalakis Athletic Center Jan. 30. Prior to the game, Pearson thought they would have revenge on their minds following the Dragons’ 89-49 victory on their home court exactly two weeks ago. The final score of the game is misleading in that it suggests that the Dragons went wire-to-wire in command. In reality, the two teams were only separated by three points — 35-32 — at halftime before Drexel outscored the Tribe by 37 in the second half. The Dragons shot an incredible 68 percent from the field, including 62 percent from three, in the second half to amass 54 points in the final 20 minutes. 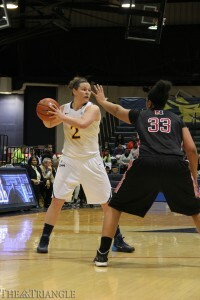 According to Dillon, that was the greatest half of shooting her team has ever put together in her 11 years at Drexel. To expect that to happen twice two weeks apart would be foolish, so she also expected a competitive game. Contrary to the beliefs of Dillon and Pearson, and very much to the testament of the Dragons, the game was actually not close at all. 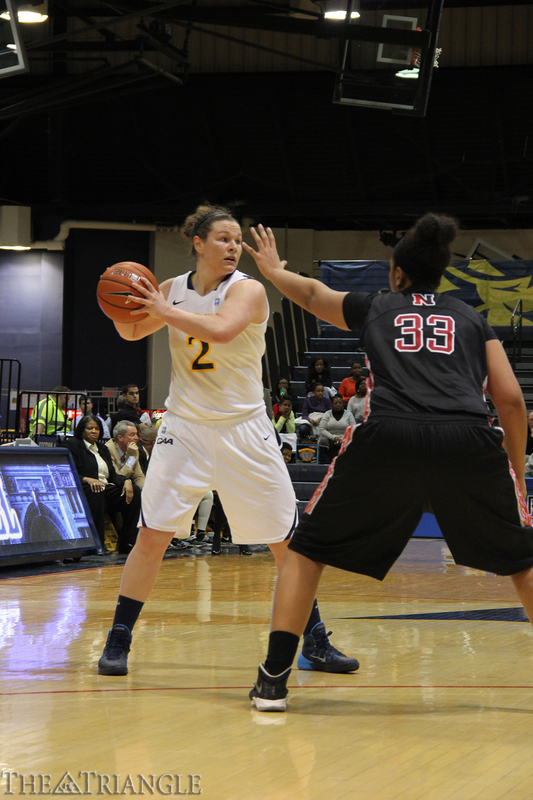 Drexel recorded a wire-to-wire 66-42 victory Jan. 30 against William & Mary at the DAC. The next game for the Dragons will be Feb. 2 when they host Hofstra University.